Do you often find yourself with your hands full of shopping bags and struggling to fetch from your pockets or your handbag the key to your home? Well, you don't have to any more! Nowadays, you can equip your door with a smart lock, and you will be able to unlock it without even having to use a key, either by just touching the lock (as in the case of Kwiskset Kevo) or by simply being there by the door (as in the case of August Smart Lock Pro). The main technology behind these locks is Bluetooth, the wireless communication protocol, that allows the lock to detect your presence by the door and unlocks the bolt. You download the free app associated with the lock to your smartphone. You stand by the lock to link it to the smartphone via Bluetooth in order to provision the lock to the app. This procedure is very simple, takes seconds and is described in the user documentation that you get with the lock. Once the lock has been provisioned to your smartphone app, all you have to do to unlock the door is to keep your smartphone in your pocket turned on, and either touch the lock, as in the case of Kwikset Kevo, or just stand by it, as in the case of August Smart Lock Pro. As simple as that! With certain smart locks, like the Kevo for instance, you don't even have to carry the smartphone on you: you are provided with a tiny device known as a fab that you carry on your key-chain. The smart lock detects the presence of the fab when you are close-by and unlocks the door. To prevent false and insecure unlocks, these smart locks support special technology that detects whether you are inside or outside your home when you are close to the door. Note also that smart locks allow the use of the physical key if desired. They are safer than hard keys that can get lost and codes that can be copied. They provide you with eKeys (electronic keys) you can send to anyone you choose to have access to your home. Once equipped with the eKeys you sent, your guests will just need to have their smartphones in their pocket to gain access to your residence without the need to exchange physical keys. No more keys under the mat! You can even schedule the eKeys by clearly defining when and for how long visitors are authorized to access your home. eKeys are messages that tell your guests how to download the app and authorize their phones to open your lock. eKeys can be deleted or disabled for a given period of time. Unlike physical keys which can be duplicated and distributed without your knowledge, eKeys allow you to track closely who has actually been at your home. Viewing the log created by the app on your smartphone, you are able to know who has entered and exited your home and the exact time they did it. 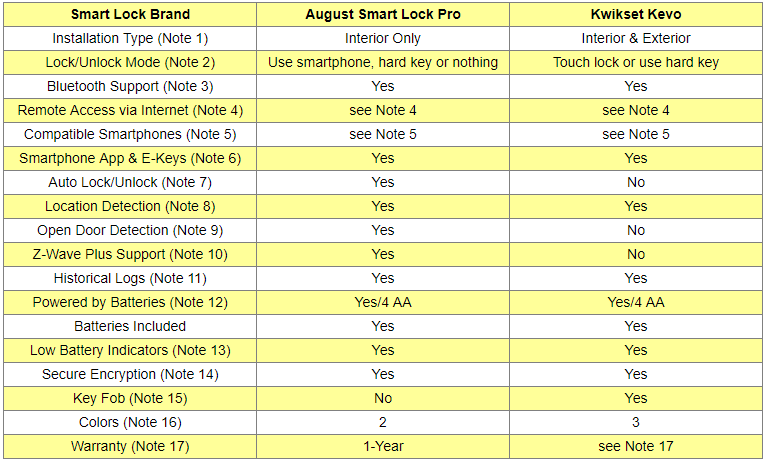 This article will compare August Smart Lock Pro and Kwikset Kevo 99250-203 smart locks. Note that these were the most popular smart locks among Amazon customers at the time this article was written. August Smart Lock Pro replaces the interior portion of your door’s existing deadbolt. The exterior portion of the bolt is not replaced. Kwikset Kevo replaces the existing deadbolt inside and outside. By tapping the property on the smartphone app. By simply approaching the door without needing to tap the smartphone app (you will need to have your smart device on you). By using the hard key. August Smart Lock Pro supports remote locking/unlocking over the internet with the use of the Wi-Fi supporting accessory device: August Connect hub (see below the Amazon products section). ​When you use August Connect, your August Smart Lock Pro becomes also compatible with Apple’s HomeKit & Siri, with Amazon’s Echo & Alexa, and with Google Home & Assistant. By simply touching the lock (you will need to have your smart device on you). For remote access, you will need to purchase the Kevo Plus upgrade from the company, so you can connect to your Kevo from anywhere as long as you have a working internet connection. The upgrade includes the Bluetooth enabled Gateway and Kevo Plus remote service. To upgrade to Kevo Plus, you will need to login to your Kevo account on mykevo.com. Once you have upgraded, the company will ship you a Bluetooth enabled Gateway that will allow you to connect your lock to Kevo Plus. There is no monthly service fee for Kevo Plus, but there is a one-time upgrade fee which was $99 at the time this articel was written. Bluetooth technology is useful when transferring information between two or more devices that are near each other. The maximum distance it can support is about 30 feet (about 10 meters). In this application, Bluetooth technology syncs your smartphone directly with your smart lock. Bluetooth 4.0 and up is required. With August Smart Lock, you can control the lock remotely if you equip your home with the August Connect accessory device which is sold separately (see below the Amazon products section). August Connect seamlessly combines with August Smart Lock Pro to offer an intelligent, secure way to lock or unlock your door when you’re away from home. It simply needs to be plugged into any power outlet near your August Smart Lock Pro and uses your home’s WiFi and Internet connection to control your August Smart Lock Pro. With August Connect, you can unlock or lock your door for guests, check your lock’s status and receive instant notifications wherever you may be using the August app. 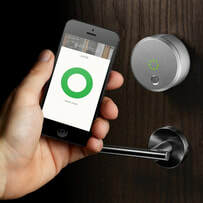 To optimize August Connect’s always-on connection, one August Connect is needed for each August Smart Lock Pro. With Kwikset Kevo, to get remote access, you will need to purchase the Kevo Plus upgrade from the company, so you can connect to your Kevo from anywhere as long as you have a working internet connection. The upgrade includes the Bluetooth enabled Gateway and Kevo Plus remote service. As mentioned above, to upgrade to Kevo Plus, you will need to login to your Kevo account on mykevo.com. Once you have upgraded, the company will ship you a Bluetooth enabled Gateway that will allow you to connect your lock to Kevo Plus. There is no monthly service fee for Kevo Plus, but there is a one-time upgrade fee which was $99 at the time this articel was written. August Smart Lock Pro is compatible with iPhone 4S, 5, 5C, 5S, 6 and up, Android 4.4.4 and 5.0 and up. Kwikset Kevo is compatible with iPhone 4S, 5, 5C, 5S, 6, 6 and up, Android 5.0 and up. August Smart Lock Pro app allows you to send as many free eKeys as you need to family members and friends with a compatible smartphone or tablet, so they can access your home even when you are away. The app allows you to manage the eKeys: you can cancel them or schedule them for specific periods or exact times as needed. It also provides a detailed log of who has entered and exited your home, and exactly when they did. To unlock, you have the choice of either tapping the property on the app, or approaching the door with the smartphone in your pocket, in which case you don't have to tap the app. Kwikset Kevo app also allows you to send eKeys to family members and friends, but it does it in a different way: Two permanent eKeys are included with the purchase. These eKeys never expire, can be reassigned from one person to the next, and can be designated either as Anytime or Scheduled. Scheduled keys allow you to set time constraints for the recipient. Also included are free, unlimited Guest keys which give your guests unrestricted access for a 24-hour period and will then be automatically deleted. Like with August Smart Lock Pro, using the app you can see the history of the lock activity. To unlock you just need to touch the lock; the app runs in the background on your device so there is no need to open the app to enter your home. ​Note that both apps are free to download. The auto lock/unlock feature is available only on August Smart Lock Pro. With auto-unlock, August senses your approach and unlocks the door, without having to reach for your phone. In addition, you won't have to worry anymore about forgetting to lock the front door when you go out: the device will automatically lock your door behind you. The auto-lock/unlock feature is optional and can be disabled at any time, depending on your habits. Note that August Smart Lock Pro uses proprietary techniques to prevent false unlocks from the interior side of the door. When the auto-unlock feature is turned on, August Smart Lock Pro detects whether you are inside or outside before unlocking. Clearly, for security reasons, you don't want the door to be unlocked automatically if you are inside your home. With Kwikset Kevo, again for security reasons, you don't want the lock unlocked if you're inside your home and someone outside touches the lock. Kevo determines if you are inside or outside the door to prevent unauthorized entry. August Smart Lock Pro comes with DoorSense, an intelligent, integrated sensor that tells you if the door is open or closed. Many people leave home thinking their door is securely closed and locked when the door was actually left ajar and the deadbolt unable to properly engage. With DoorSense installed on your door, your August Smart Lock Pro can detect when your door is open or closed in addition to whether or not the deadbolt is locked. If you accidentally leave the door open as you are rushing to work in the morning, you will receive an alert through the August app. An open green circle in the app indicates that the door is unlocked and a red circle that the door is locked. With DoorSense, two new states have been added, a broken yellow circle indicating your door is open and unlocked as well as a broken red circle to let you know your deadbolt is thrown and your door isn’t properly closed. Just like the August Smart Lock Pro, DoorSense is easy to install. You can choose to use a surface mount with the double-sided tape provided or a flush mount inside your door frame using a drill with a ⅝” drill bit. Z-Wave is a wireless communications protocol used primarily for home automation. It uses low-energy radio waves to communicate from appliance to appliance, allowing for wireless control of residential appliances and other devices, such as lighting control, security systems, thermostats, windows, locks, swimming pools and garage door openers. For both locks, detailed history of all lock activities is logged by their app and can be viewed anytime. Because both locks are powered by batteries, they always stay on. Alerts are sent to your smartphone when batteries start running low. Note that the batteries are included in the purchase. When the batteries are running low, you'll receive notifications on the app. The Kevo will also flash red. Both locks use encryption for secure communications. August Smart Lock Pro uses 128-bit AES software encryption. The fob, shown below, is small device that allows you to unlock your Kevo smart lock without using a smartphone. 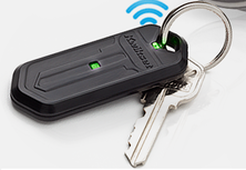 You just need to keep your fob in your pocket, purse or backpack and you will enjoy the same touch-to-open convenience as if you had a smartphone. ​A Kevo fob is included when you purchase the deadbolt. It is pre-enrolled, so no additional setup is required. Additional fobs are available for purchase. They need to be enrolled as eKeys before they can be used. 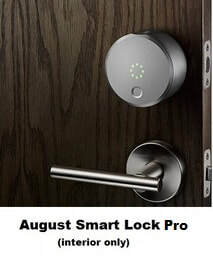 August Smart Lock Pro is offered in silver or dark grey. Kwikset Kevo comes is offered in polished brass, satin nickel or Venetian bronze. Kwikset Kevo comes with a lifetime mechanical and a 1-year electronic warranty. So which of the two smart locks to get? If you need to control your lock remotely from anywhere, you should consider getting August Smart Lock Pro which allows access over the Internet when you also purchase the August Connect accessory (see below Amazon section). With Kevo, at the time this article was written, remote control was not possible. ​Note that, with Kwikset Kevo, you can also access the lock remotely from anywhere. But, you will need first to purchase the Kevo Plus upgrade from the company. The upgrade includes the Bluetooth enabled Gateway and Kevo Plus remote service. If you don't want to pay $1.99 for each extra permanent eKey, you should consider August Smart Lock Pro which does not charge any money for issuing eKeys (note however that Kevo does not charge for the temporary Guest keys). 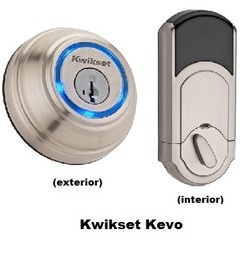 If you have guests with no smartphones, and you want to be able to give them access to your home, you should consider Kwikset Kevo which comes with a fob your guest can carry on, and which unlocks the smart lock just as the smartphone would (see the Amazon products section below for additional fobs). If you want to be able to unlock without touching the lock or using your hands at all, consider getting August Smart Lock Pro which unlocks hands free as you approach the door. For a simpler installation that requires modifying only the interior part of your door's existing deadbolt, consider getting August Smart Lock Pro. Note that detailed installation procedures are described in the user documentation that comes with the locks. Finally, if you want a lifetime warranty on mechanical parts instead of 1-year, then consider Kwikset Kevo. Exact prices and additional information on both August and Kevo locks can be found below in the Amazon products section. Please click below the smart lock of your choice and any of the accessories you may need for price information or to purchase. ​Note that additional colors will be offered when you click the Amazon product link images below.